Diamond-based imaging system uses magnetic resonance of electrons to detect charged atoms and peer at chemical reactions in real time. The new microscope can give a quantum MRI view of copper ions. A quantum microscope that uses a sensor built from diamonds could allow researchers to study such nanoscale mysteries as how DNA folds in a cell, why drugs work or how bacteria metabolize metals. Crucially, the microscope can image individual ions in a solution and reveal biochemical reactions as they occur — without interfering in the process. The team behind the system described the results in a 14 February preprint on the arXiv server1. Researchers have long wanted an imaging system for molecular structures that works like hospital magnetic resonance imaging (MRI) machines, which reveal structures inside the human body without harming them. The idea behind a quantum MRI — which images at the quantum level using electron spins — is to do the same for chemical reactions including those involving metal ions. Current magnetic resonance techniques can only reveal structures measuring 10 micrometres or more, and the only way to detect metal ions inside a cell is to add reactive chemicals or freeze the cell so it can be imaged under powerful microscopes — procedures that kill the cell. A hospital MRI machine works by placing a patient inside a magnetic field, such that protons in the body's atoms align with the machine's magnet. The machine then sends radio pulses through the body area being imaged, which knocks the protons out of alignment. When these pulses are switched off, the protons realign and emit electromagnetic waves at a particular frequency. If the frequency emitted by the body's tissues matches that of sensors in the machine, the two frequencies will resonate like guitar strings tuned to the same note. The machine uses this resonance to reconstruct an image of the body. A team led by physicists Lloyd Hollenberg and David Simpson at the University of Melbourne, Australia, wanted to use this technique to detect metal ions in cells. Some metal ions can be harmful to cells, whereas others are necessary for biochemical reactions, such as those involved in metabolism. The catch is that an MRI sensor needs to be about the same size as the item being imaged, which is currently impossible when trying to look at a single atom. To make their quantum MRI microscope, the researchers used 2-millimetre-wide diamonds that contained atomic-sized flaws in their crystal structure. These flaws are sensitive to changes in magnetic fields and can be 'tuned' to resonate with the spin of the molecule or ion that is being detected. When the diamond's flaws are illuminated with a green laser, the diamond fluoresces red, and the brightness of that fluorescence depends on the strength and direction of an applied magnetic field. 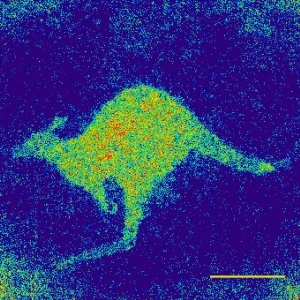 Hollenberg, Simpson and their colleagues used a diamond that had an array of flaws in specific locations just below its surface and placed it at the end of a microscope next to a sample. The researchers tuned the defects to a frequency that resonated with the spin of an ionized form of copper that is missing two electrons (Cu2+). By touching the diamond probe to the surface of a sample containing copper ions, the resonance between the two stimulated fluorescence in the diamond flaws. The researchers used a computer program to examine the colour coming off the diamond flaws and to reconstruct an image of the sample, revealing the precise location of each copper ion. Next, the researchers flooded the sample with an acid that adds an electron to Cu2+, turning it into Cu+. As they added the acid, they imaged the sample and watched the Cu2+ spin pattern disappear. The pattern then reappeared over the course of an hour as the sample was oxidized to Cu2+ on exposure to air. Such a method could one day allow researchers to watch biochemical reactions as they occur in cells. Because the method is non-invasive, it could theoretically be used to image the interior of living cells — something that Simpson and Hollenberg's team is working towards. The main obstacle is that the diamond probe needs to be physically close to the sample to produce a signal. But the team says that the current method will still be useful for understanding drug mechanisms and investigating proteins found on the cell membrane. The researchers are also trying to adapt the system so it can detect different metals, including iron. Friedemann Reinhard, a physicist at the Technical University of Munich in Germany, praises the work. “The innovations here bring it a lot closer to the application,” he says. 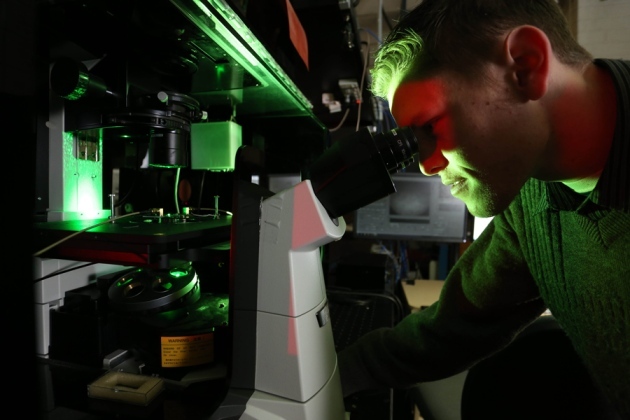 His group is also working with diamond microscopy, creating a system that could image molecules in 3D. He adds that although the new technique still needs improvements, such as the ability to find copper ions in low-concentration solutions, it is “definitely a great step ahead”.